I want to share with you our latest project. 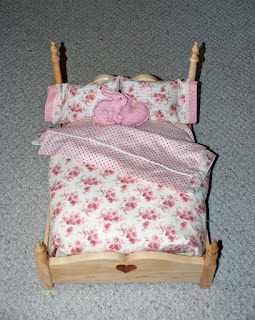 It is a doll bed for our granddaughter's sixth birthday. Papa designed and made it out of maple, with little cedar heart appliques he carved. I made the mattress, sheets (fitted and top), ticking pillows, pillow cases, tied quilt and throw pillows. Her Aunt is sure it needs a knitted afghan at the foot of it! Bella received an American Girl doll (Ruthie, Kitt's friend) for christmas. 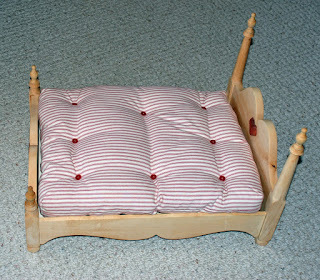 We decided on making a doll bed for her birthday in March. She is going to absolutely love it. I can't stop playing with it myself. Yesterday, a friend was over and we had to "dress" it again. C. came into the kitchen and asked "What is it about these things that girls get a kick out of?" Okay, you can leave now, I will never be able to explain it to you. Let's just say that our daughter Kate (Bella's Mom) is going to be playing with her American doll (Samantha), too! How can you resist something this cute? Those miniature ticking pillows and pillow cases with the lace trim, have put me over the edge. Here, I thought I was the queen of "cute" at seven, when I made a Barbie bed out of a kleenex box. Hey, don't laugh she was pretty hot in her Puffs box car too! on Saturday and I will miss it. I am pretty sure Bella will let me play with it when I visit. Thank you Papa, this was a fun collaboration. If you would like to see more pictures, they are here. I am soooo asking for a dollhouse for Christmas! Absolutely Amazing...Can I ask for one for Christmas...three boys huh?